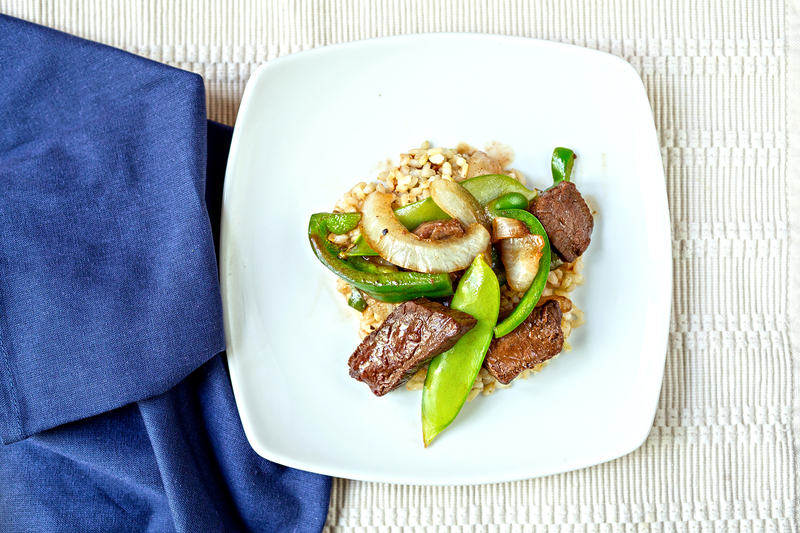 Give a gift to future you with homemade stir fry, right from your freezer. I decided to try this because I’m leaving town for 3 weeks and I don’t want my husband to starve. (Or live off bagel bites and beer.) This is also great if you’re sending a kiddo off to college – in an apartment, not a dorm – so they don’t live off bagel bites and beer. Or if you know you have a busy time coming up (like the holidays, or you’re having a baby). I have a lot of friends in the baby-mode right now, so I’m actually thinking of expanding this and giving easy instructions for their husbands. You could do 3 proteins (steak, chicken, shrimp), 3 starches (rice, noodles, quinoa), 3 sauces (Asian sauce, pesto anddd… something I haven’t thought of yet, like lemon garlic or dijon or maybe some kind of curry) and a bunch of different veggies. Then you can pacakage all the meats together, all the veg together, etc and write in sharpie on the outside of the bag with instructions like, for the meat bag “Pick one. Heat oil in a pan and sauté until warmed through.” Etc. While the prep time and freezing is kind of a lot of work, the stir frying part really did come together in a flash (about 10 minutes). Definitely cut the meat and veggies into more bite-sized pieces than I did. Since venison tends to be tough, the large bites were a little chewy. The long snap peas were also a challenge. I also doubled the original recipe to make 2 frozen meals that each feed four adults, so you can split them up accordingly depending on how many people you have. Having said that, I didn’t double the sauce recipe and thought there was plenty of sauce to split it 2 ways. If you like your stir fry on the saucier side, though, you can double that. I’m actually leaving the rice out of my freezer meal. It saves a step and my husband can cook rice, if he decides to eat it at all. Leaving the rice out also makes this nearly paleo. Steam the rice and let cool completely. Put the sliced veggies on a parchment-lined cookie sheet. They can touch a little bit but need to be in one single layer. Add another sheet of parchment and another layer of veggies on top if necessary. Freeze until frozen through, about 3-4 hours. Heat a pan to medium high heat and spray with pan spray. Season your venison with a little salt and pepper on each side, and pan sear until medium rare, about 4-5 minutes per side. Remove and let rest for a few minutes. Slice into thin, bite sized pieces. Then spread the pieces out on another parchment-lined cookie sheet. Again, the pieces can touch but need to be in one layer. Add a second sheet of parchment on top for a second layer of the meat if necessary. Freeze until frozen through, about 3-4 hours. Whisk together all the ingredients for the sauce. Put half and half in 2 small ziplock bags and freeze. 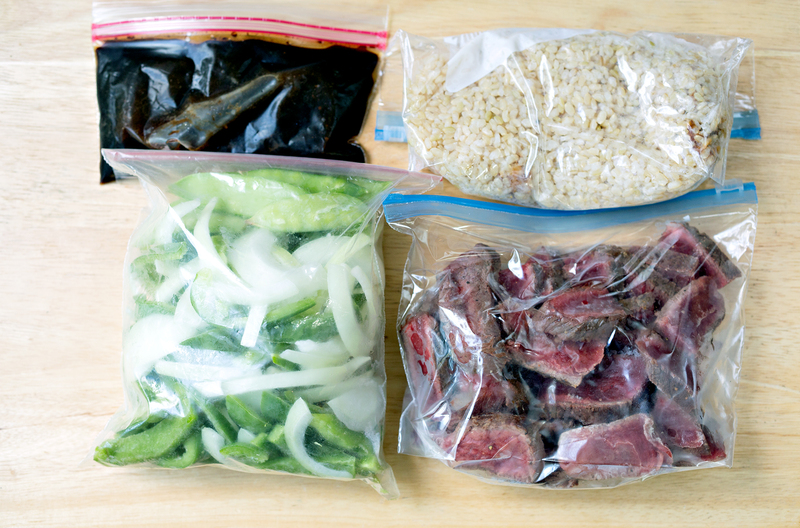 Once the rice is cool, separate into 2 ziplock bags and freeze. 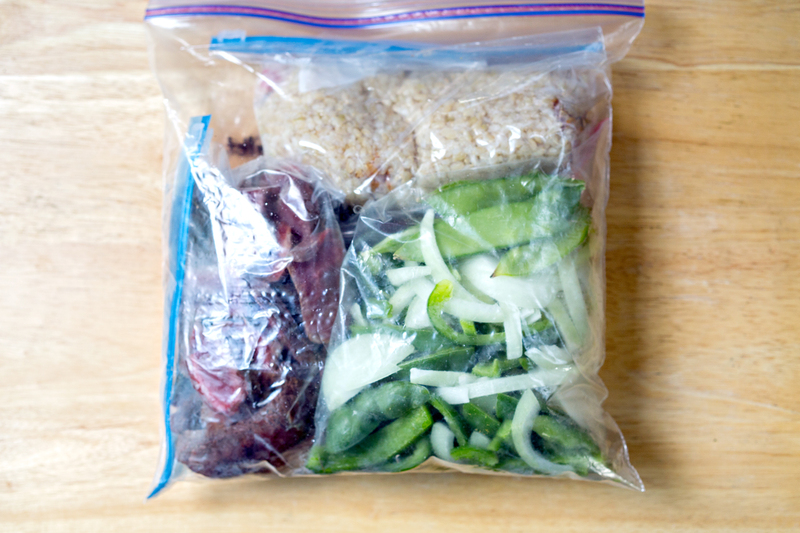 Once the meat and veggies are frozen, separate the veggies in half and put in 2 ziplock bags. Do the same with the meat. Once everything is frozen, combine all of them in 2 gallon ziplocks, putting one of each bag into each gallon ziplock and freeze until ready to use. Once you're ready to cook your pre frozen stir fry, place the sauce in a bowl of hot water to thaw. Remove the rice from its ziplock and reheat in the microwave. You can also add it to the end of the stir fry if you want to do it all together. Meanwhile, heat 1 tablespoon of oil in a pan over medium high heat (about a 7 out of 10). Add the meat and stir fry until warmed through. 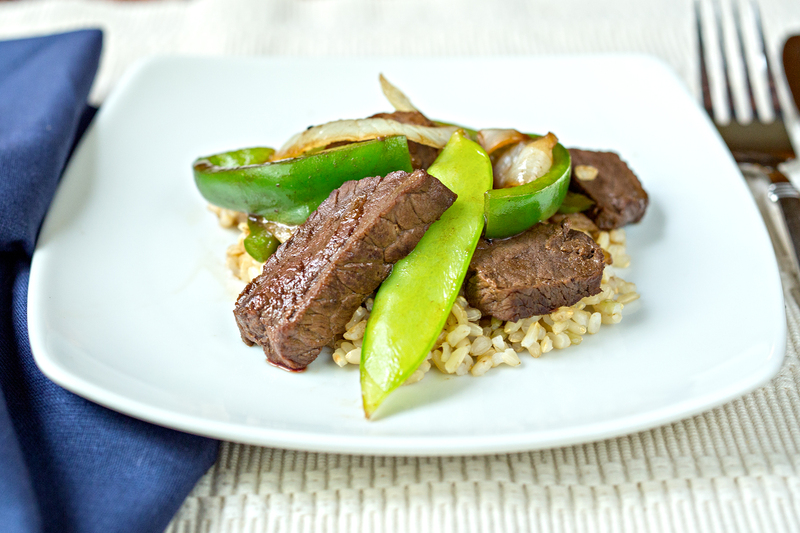 Once meat is cooked, add the veggies and continue to stir fry until they are warmed through and tender. Add the sauce and continue to cook until the sauce slightly reduces and everything is coated. Serve over warm rice. Non game substitution: You can do this with any meat, like chicken, shrimp or pork. If using anything that isn’t steak, make sure it’s really mostly cooked before freezing it, just to be on the safe side. Steak can be medium rare.